A Solo mode is also rotating in after that. 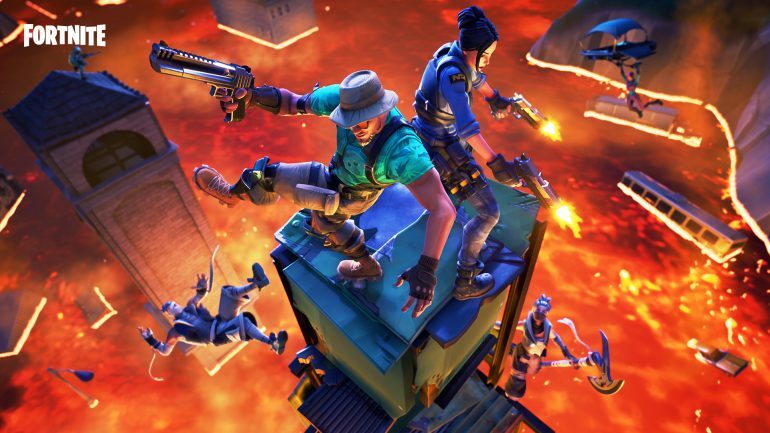 Epic Games is planning to rotate The Floor is Lava Limited Time Mode in Fortnite: Battle Royale from Duos to Squads and Solo. An Epic employee who goes by DustyDevo on Reddit said the Squads mode will be available this weekend. The plan is to rotate the three styles in the mode instead of having all available at the same time at any point. DustyDevo wrote that otherwise “that many playlists would make matchmaking take longer than desired.” A big-team The Floor is Lava, like a 50-vs-50 mode, will be missing from this first rotation as DustryDevo said it’s not in the works right now. r/FortNiteBR – Floor is lava DUOS?? The Floor is Lava was added yesterday as part of the v8.20 Fortnite update. Players in this mode have to be the last team standing while lava is constantly rising and covering the map, which eventually has all its buildings and mountains swallowed up by the lava. The map becomes a huge pool of lava in the late game, and players have to build structures to avoid touching it. Players receive materials passively to be able to survive the lava in the late game. Touching it deals damage directly to the player’s health, so it’s common to see players shooting at opponents’ structures to make them fall onto the lava rather than shooting directly at them. Glider Re-deploys are also a key item to survive in The Floor is Lava. If you want to play the mode before the weekend, it’s currently available in Duos. Epic has yet to announce when the Solo mode will rotate in, probably replacing the Squads mode that’s going live on the weekend.